I have ucandas they recently roll out the 2015 update for GM and it’s very up to date on Ford. I scanned 2014-2015 Fords before with it. Its somewhat ok on SRS. I got ucandas when first came out and it used to diag nissan very good until i did firmware update, I even have the first disc they sent with tool before they had the online register service. It’s not a bad scanner…They use to listen to me and take my input.I love the wireless scan..and since they actually listen to me and been adding seat cal for most of the car its gotten better. They are very outdated on Nissan thought…up to 2011…I have my eye on the GreenDS GDS+ 3, updates for Autel is a B****. the good thing about launch compared to autel is that launch has been on the market for very long time and they have updates all the time, ive had it for years and there really good for that compared to autel which i believe copied software for launch once and is good but they never update anything, very seldom updates. seriously I have lots of oem scantools but use launch sometimes even on those cars when I dont feel like booting up the oem scan tool, new ford srs no problem, new nissan srs no problem, new gm srs no problem, vag, porsche, hyundai, kia no problem, only thing i wish it did was seat calibration for the hyundai kia but you can’t ask for everything, mitsubishi no problem for airbag, for the money its a steal for what it does. Don’t expect carprogs built in crash cleaners to have a lot of coverage expecially if you are in USA…I rarely use it for that. As for diagnostics Launch is good start just dont go for diagun…it’s to finicky for every day shop use, i droped mine and it broke. Depends how much work you do and how deep into you get but none of those do it all uiversal scanners can really do everythng…i used to have launch. 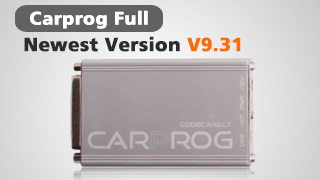 If you have AVDI it works as an interface for a lot of OEM software (I use toyota, subaru, kia/hyundai, volvo)….good quality Ford VCM from china works just like original, there is some good quality benz and BMW units out there, vag com and VCP for vag, hicom is supposed to be good for kia/hyundai (havent tried it, will probably get it soon), Honda HDS interface is very cheap from china and latest software can be found online and works great never failed me….